Have you made Easter eggs? Have you been available for Easter bunny? Are you also ready for Easter sales at Romwe’s? It’s high time to create a new look for yourself. Throw off your coat, sweater and scarf and embrace a new round of sales of Romwe. Need new attire for Easter Day? Then you’ve come to the right place. They have tons of stylish women’s clothes to dress up for Easter Sunday. More than 1000 styles on sale! Starts from Apr 15th, ends on Apr 22nd, 2014. 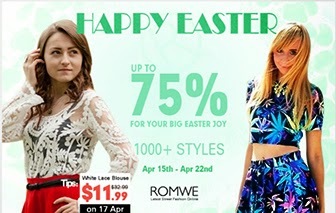 Happy Easter, up to 75% off at Romwe, free shipping. Don't miss out this wonderful sale this easter break! Happy Shopping!! !